Newegg has the refurbished Nook Color on sale today, and this is the cheapest I've ever seen it. They're asking $115.99 for an ereader which was originally released 18 months ago and still has a sizable enthusiastic user base. The NC is based on a 7" IPS screen and it's running a closed version of Android on a 1GHz CPU with 8GB Flash, Wifi, and a microSD card slot. 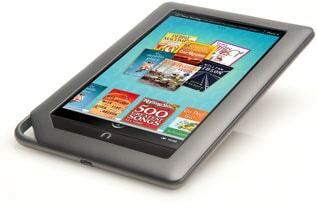 This is an excellent value for an ereader, though there are some Android tablets that cost less. Wow. That’s lower than a Nook Touch with Glowlight. Another sign of Armageddon. Or clearing out the old model that they’re not interested in selling any more. Same thing; they need to make room for the 8 & 16GB Tablets. Either way it spells: C-l-e-a-r-a-n-c-e. These don’t appear to be “certified” OEM refurbished, but comes from a company called Sohnen Enterprises. They only have a 30 day warranty. Correct me if I’m wrong, but don’t B&N’s certified refurbished Nooks come with the full one-year warranty?